Ellis Bella style B canvas ballet shoe is made of high quality canvas,the split sole design maximizes the flexibility of the shoe, and nice wrap around the foot. • Full cotton lining and absorbent insole reduce moisture. • It is simple and comfortable Ballet shoes which is great for the ballet lesson, yoga stretch and indoor activaties. Fitting: canvas ballet shoes is average wide fitting only. 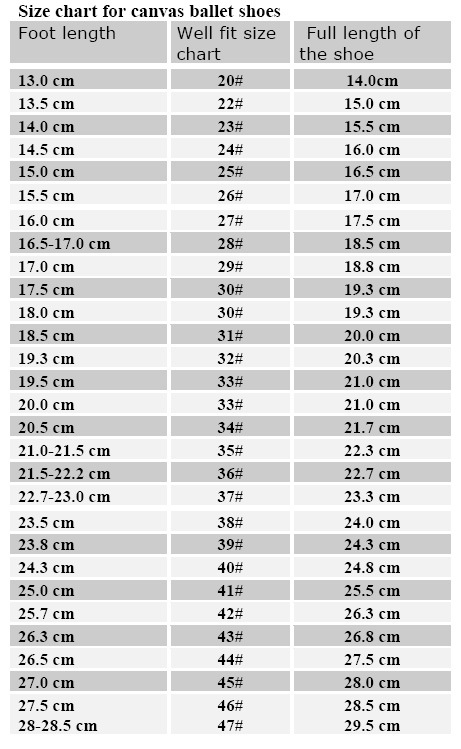 recommend size chart is comfortable fit. for great snug fit foot length the same as the full length of the shoes. If you are a narrow fitting, and need great fit pls don't go with this range, they are average fitting only. For wide fitting can upper size for comfort. 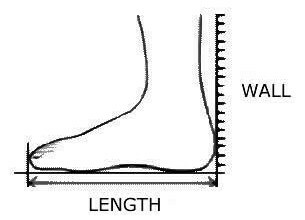 This is a Guideline to help you to determine your foot length. Stand up with the heel attach to the wall and measure the distance between the wall and the very last end of the biggest toe, to have you foot length.